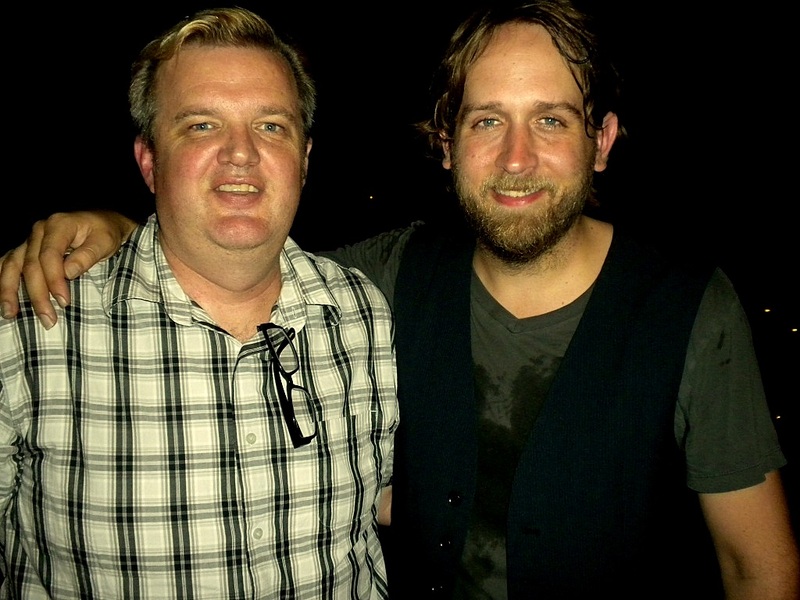 It has been two years since the release of “Trouble in Mind” on Lost Highway and Hayes Carll is still garnering recognition by both his peers and the Americana Music Association. He has been compared to Townes Van Zandt in the tradition of the best songwriters Texas has to offer. 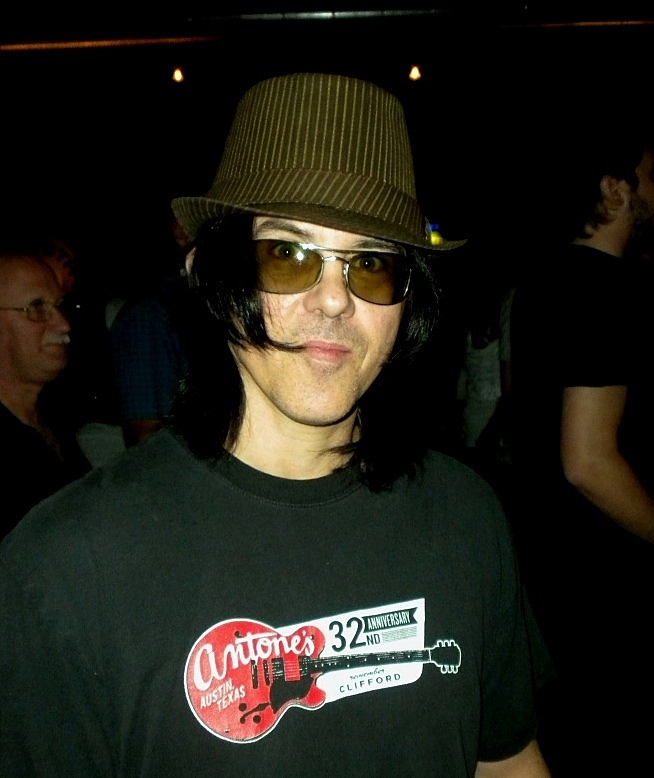 Hayes had won AMA Song of the Year in 2008 with “She Left me for Jesus” one of the cleverest songs that at one point is irreverent but at the same time you can’t help laughing with lines like “She says he’s perfect, well how can I compete?” This was my first time to see him since finding “Trouble in Mind” eight months ago while rummaging through all the links Amazon had when I put in Texas songwriters. 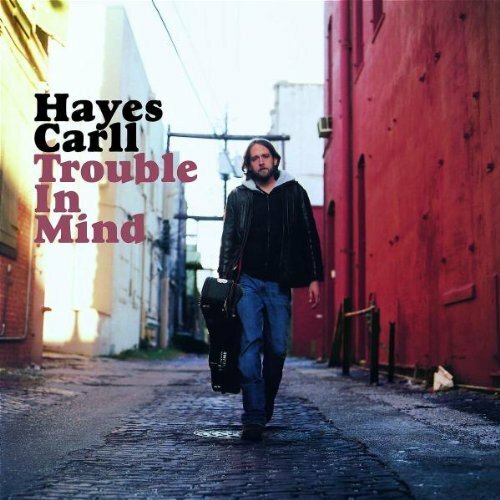 The album “Trouble in Mind” has taken Hayes Carll about as far as any artist could. 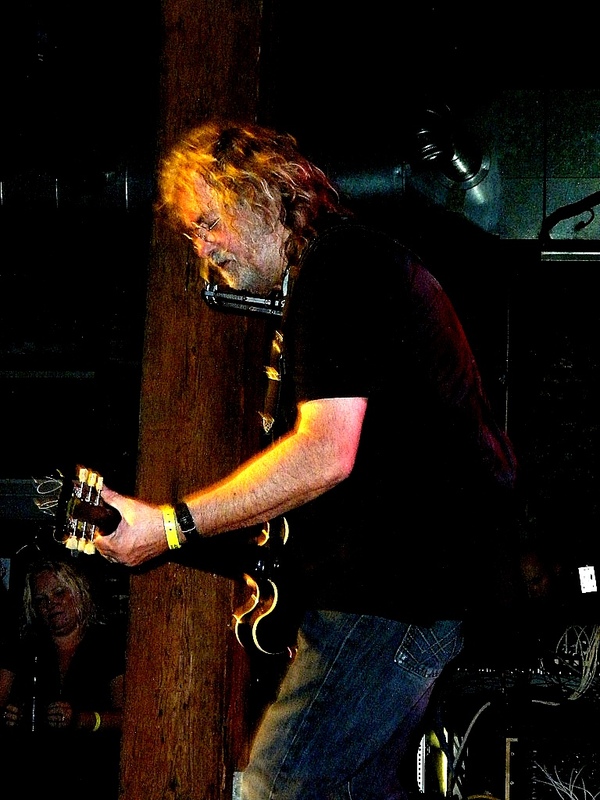 He not only won “Emerging Artist” this year at The Americana Music Association Awards, but, Ray Wylie Hubbard was up for song of the year for a cover of another song off that album, “Drunken Poet’s Dream” which opened up “Trouble in Mind” written by Hayes and Ray. 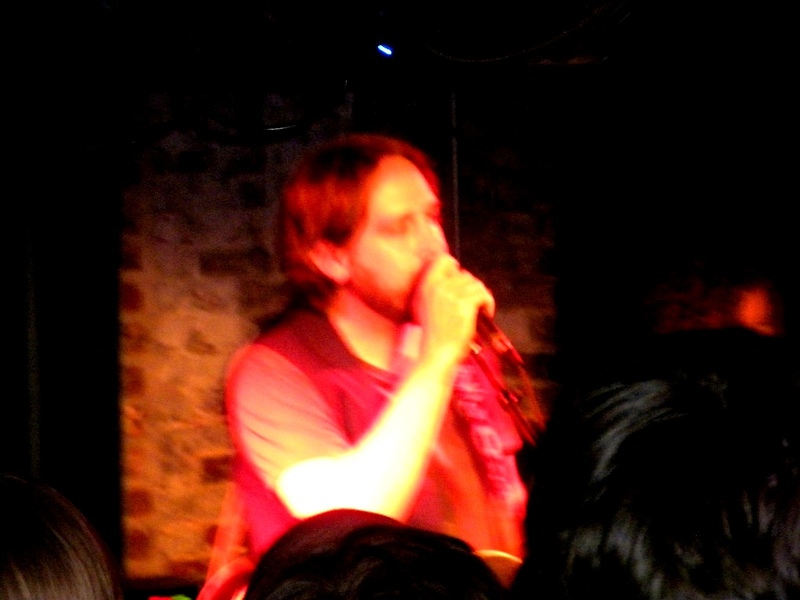 In fact, I left the show at The Basement and was at Mercy Lounge listening to Ray play it onstage 3 minutes after I arrived. If I had left any later, I would have missed it. What a Karma moment with Ray playing Hayes and his song with Ray’s son, Lucas, being featured on lead guitar. Maybe, Robert Plant would be the surprise guest the next night at the awards and overshadow what was going on, but Hayes’ had the Karma and Mojo. The song didn’t win, but, it was up against Ryan Bingham’s “The Weary Kind” the theme song from “Crazy Heart”. It is hard to argue with success and T Bone Burnett. Ryan may have opened more doors for Americana and Country music, but, maybe not as big as “Urban Cowboy” did way back when. The funny thing is “Crazy Heart” did open the door for the Texas charts. Maybe that is what T Bone Burnett wanted to do since true Country music can be found in Texas under the banner of “Americana Music” in these day and times. The banner of “Americana” is the revolution and Hayes Carll and fellow writer, Texas raised, Ryan Bingham are leading the way. Hayes did a great set, I was squished in the secondary room with just a glance of the stage here and there. It was absolutely awful, but I could say I was there with the rest of the sardines. Hayes did a slow interpretation of “Bad Liver and a Broken Heart”. 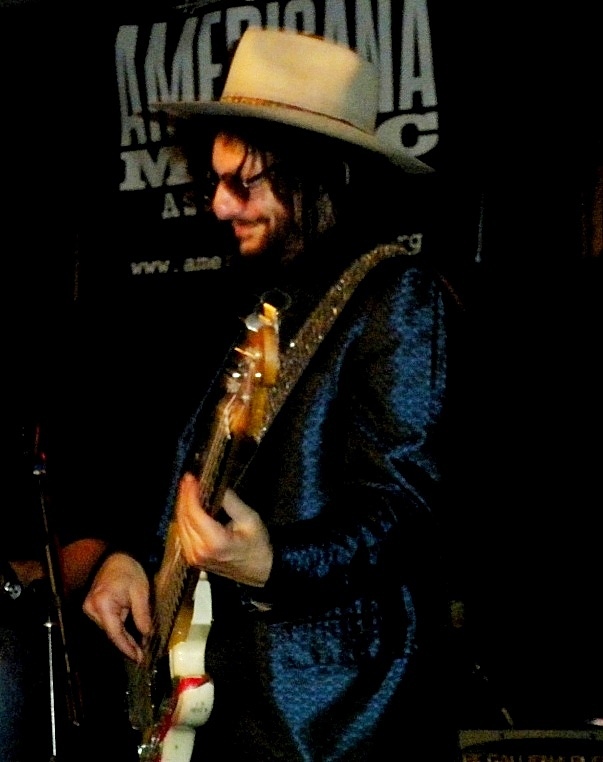 It was a great set that was with a full band that featured tour mate Bonnie Whitmore of Nashville on Bass. Hayes was one of the sardines as you can see from the sweat dripping off as he made his way out after the set. I was standing between media reps from KPIG out of Santa Cruz, California (Santa Cruz was at the forefront of the hippie scene, surf music and Punk so only fitting to hear this, a good barometer), who said “Trouble in Mind” was the only album they have played every cut and a guy from Mother Earth News who couldn’t stop saying good things about Hayes. There were plenty of Aussies and a few Englishmen. 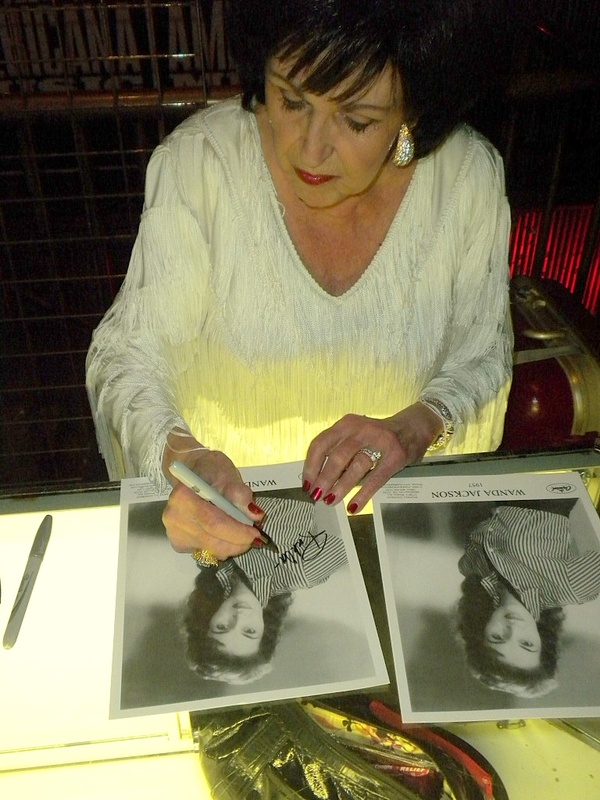 If I had only one set I could make it to, with the exception of Wanda Jackson, it was to see Hayes. He has a great sense of self deprecating humor, non cliché lyrics and a unique voice that will carry him for years. 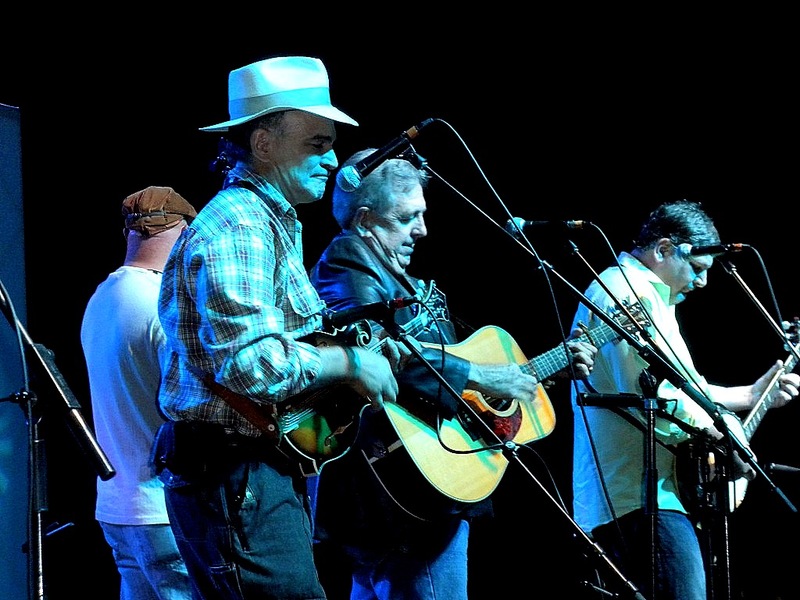 He may be the big crossover between Americana, Folk and Country as time passes. After the show, I was able to meet up with him briefly. I told him it would be good to see him on a package tour with Ryan Bingham. Hayes shared he had “talked to Ryan but they haven’t got together yet”. My feeling is that they were both unique in their own way but complimented each other’s style to build on each fan base. 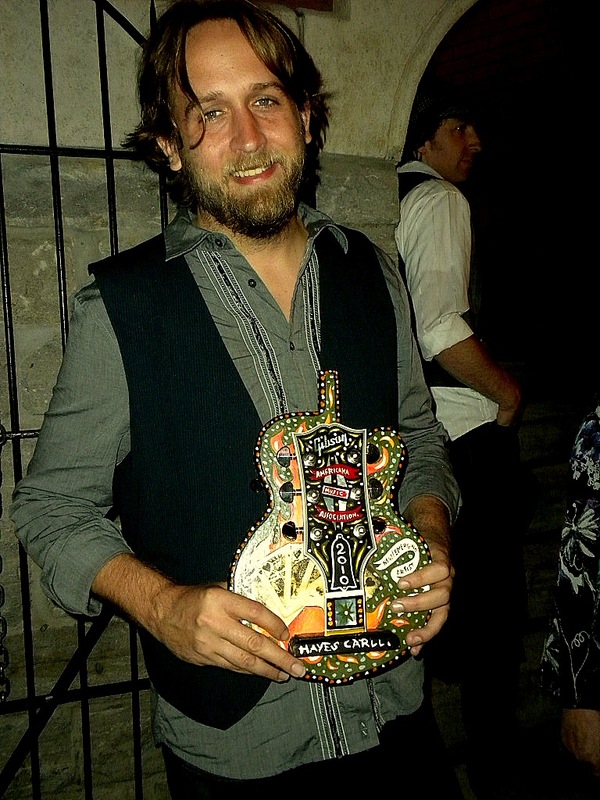 The next time I caught up with him was after the Americana Awards where his Mom was hanging onto his award for him. It looks like Gibson Guitar had a hand in making the awards with the Gibson logo headstock coming out of the wooden base. 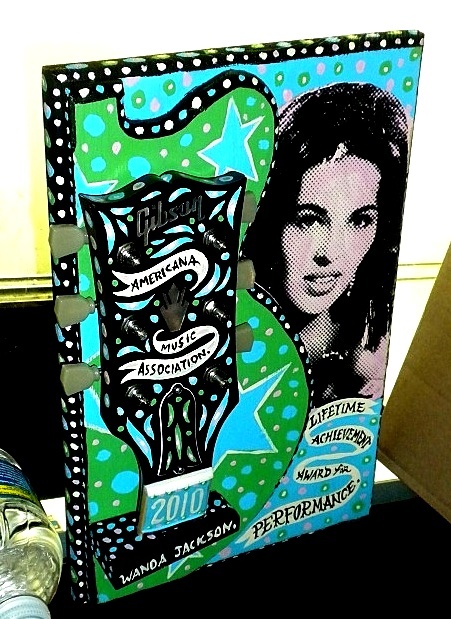 Each award was hand painted and featured some artifacts of the artist. It was cool being considered an emerging artist, yes; “Trouble in Mind” has legs and now can be considered a great album that stood the test of time now two years strong. I kind of joked about him getting the “Emerging Artist” award which he got since it has been eight years since his first album release. The thing is the award was not for “New” artist and after all, it is a great recognition from such a widespread community of artists that this album got a lot of airplay and will probably get more as the anticipation for the next release is getting strong. I would have liked to ask more questions, but, it was a big night and his parents were there to share the moment. I can always call management and schedule a follow up interview later. Congratulations, Hayes, it was a whirlwind weekend, but, hopefully will create some momentum this year. 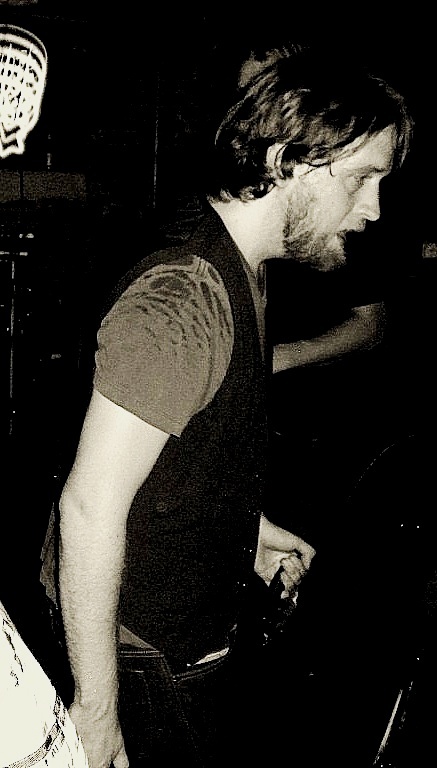 Please get on Lost Highway to update some photos and stuff on your website. After all, you deserve it. There is nothing like recognition from your peers. Good luck on the follow up. Just as Robert Plant was finishing up his surprise guest slot at The Americana Music Association Awards Show, former Dixie Chicks, as of late, Courtyard Hounds, Martie Maguire and Emily Robinson were emptying out the famed side door of The Ryman, signing autographs and taking pictures with a few of the media and locals that wandered down the beer light lit alley where John Ritter played as a boy while his father, Tex Ritter would be performing in the Mother Church, the home of The Grand Ole Opry. I asked Martie if they were the surprise guests being talked about and she said “Nope, it was Robert Plant”. After which, I let her know that we had a general consensus that is who it would be. Yes, every time the stage door would open to the back door at the top of the stairs, there was no mistaking the voice of the Golden God. It appears this could be a big turning point for the Americana Scene as it increases the sheer volume of styles and talent. WSM 650, “The Legend” will not only play the “Americana Files” on AM radio but will stream a 24/7 Americana Channel starting next week. It is amazing that a radio station that was there in the beginning is leading the way into the future. Other performers and presenters began streaming out after Robert Plant had finished his Buddy Miller lead set. 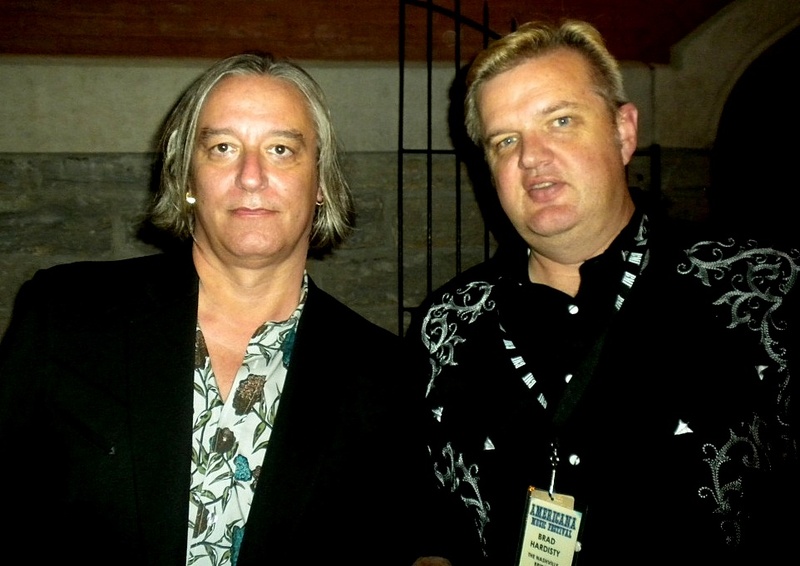 Peter Buck stopped briefly on the misty asphalt for a couple of pictures. It seemed that Artists from Country and Nashville understood what the side door of The Ryman meant. It was where Elvis, Bill Monroe, Lefty Frizell and others used to disappear into the backdoor of Tootsies and other Lower Broad watering holes back in the day after performing before sold out crowds. It has been a place where a few fans would chance to meet the Entertainers from the Saturday night airwaves. 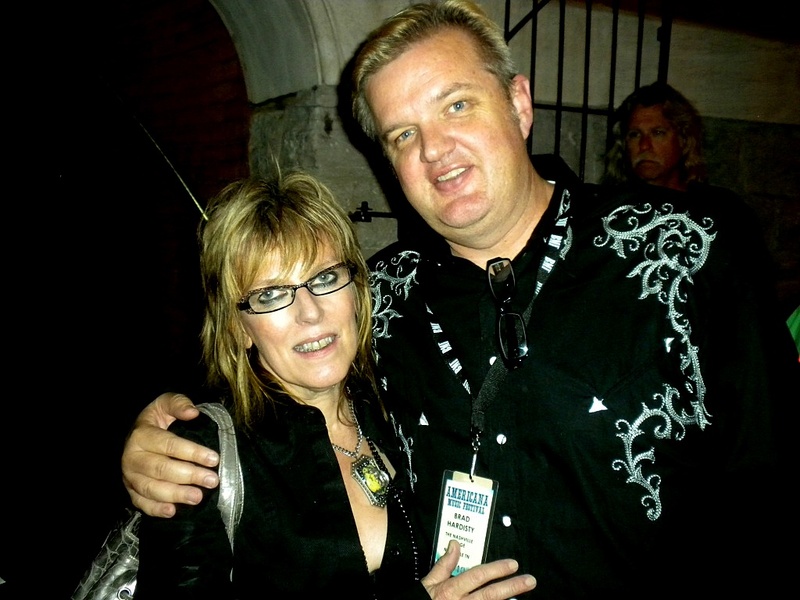 Lucinda Williams slowly made it down the stairs, appearing to be a little exhausted, maybe a little travel weary. 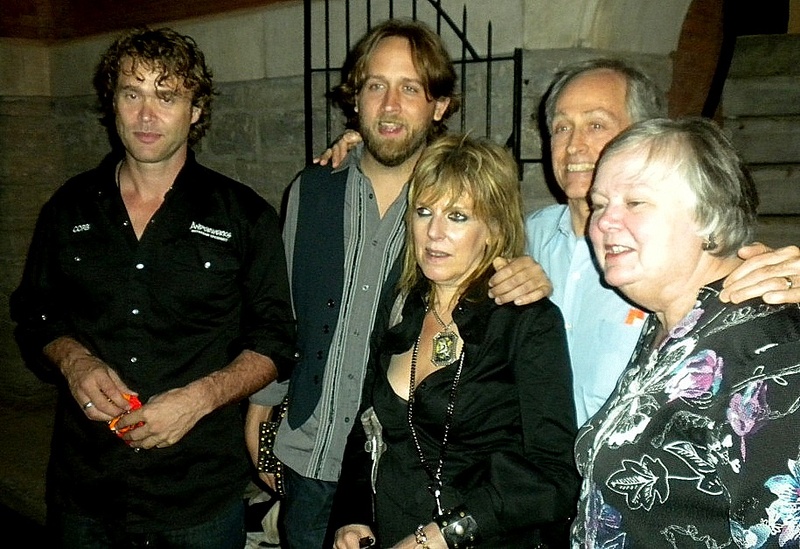 Lucinda made time to talk, sign, take pics and hang out with the few of us who had gathered to greet them in the late dewy air of The Ryman. Lucinda was Indie before there was “Americana” helping to define the genre by being fiercely independent in her songwriting and delivery. Lucinda expressed concern about what was going on in the Country, she felt she had never been this concerned before. We discussed the Pastor who was planning on having a Koran burning on 9/11. Lucinda was relieved to find out he wasn’t going through with it. A few more people came through the alley and lined up about 4 or 5 long with a man in a fresh clean promotional shirt of some new upcoming Country Artist at the very end. He waited patiently as he approached Lucinda with a piece of paper he found to get her autograph. He had a big smile on his face. A little luck had come his way this time as he walked the back alley. He could have been a homeless man or a local African-American maybe from the Southside. Who knows but he is a part of the Carnival feel that attracts even those with not much to hang down on Lower Broad. He politely asked for her autograph and shared some words with her. As he wandered west towards Tootsies, Lucinda was a little reflective and teary eyed. She said “Excuse me” as she tried to regain her composure. Lucinda lived in Nashville for nine years and I am sure some things still have not changed. I just said, “he kind of touched you didn’t he?” She responded, “He probably wasn’t even at the show, if I had known, somehow, you know I would have gotten him in somehow… his name was Perry”. She was very reflective for a moment. I said “You never know. There may be a song in that”. Her Manager said, “There can always be a song in something”. Lucinda noted “You know it’s one of those things where what if Jesus was somebody in the crowd that nobody paid any attention to”. We all seemed to think about it for a moment. Lucinda shared a little of her thoughts and some “Real Love“. What a big heart. I said, “You ought to move back to Nashville.” Lucinda just came back, “Too many cloudy days, I need sunshine”. Well, it has been cloudy this week but then again they always say “It Never Rains in Southern California ”. As she left, a few others streamed out. We soon found out Robert Plant decided to make a rock star escape out one of the other doors after security had cleared the quad and he jumped into a waiting Hummer. Not quite the “rub shoulders with Country fans” type of thing, but, hey, he is a famous person who values his privacy. As I was getting ready to leave for the next big show, Lucinda’s new friend came wandering down the alley again. I smiled at him “Hey Perry how’s it goin?” He stopped and smiled and said “How do you know my name?” I said “ Lucinda told me. You made a big impression on her”. 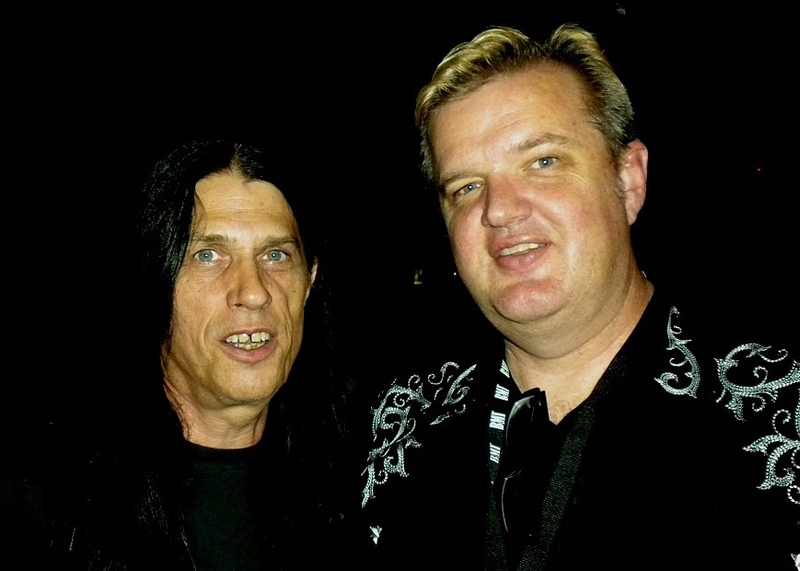 Perry smiled and said “it’s not every day you get to meet somebody famous”. He put his hand on my shoulder for a minute and smiled at me. It was there that I realized what Lucinda saw. The eyes don’t lie. He had a smile that penetrated your soul. He was as common as anybody down at the Mission with a couple of missing teeth, but, he had that “One of Gods Children” vibe that only a person with a pure soul could have. As he backed away, he stared at the Press badge with my name on it for a minute and strolled down the same path he was on before. In God’s hands.